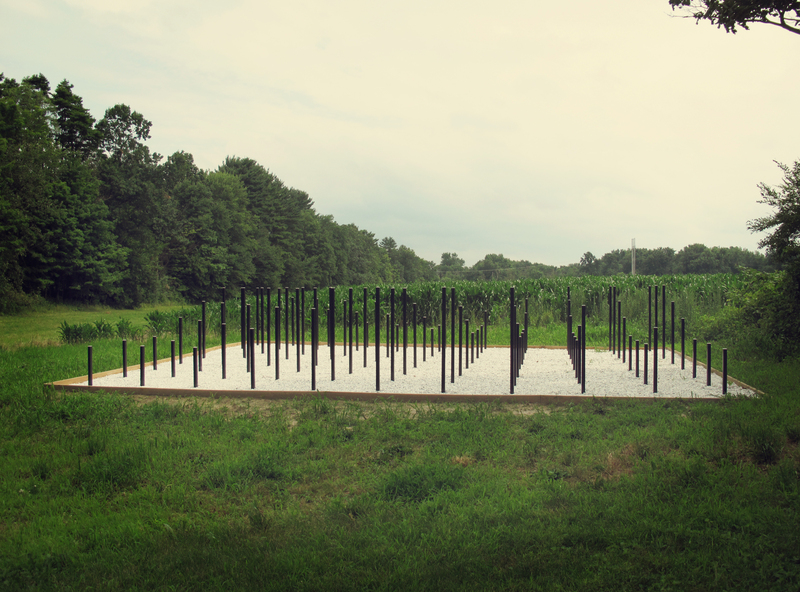 Anthony DiMari, one of my most inspired contributors, a true visionary, two-time SHIFTboston competition finalist, and graduate from the Harvard GSD has just completed ‘Undulated Inundation’ a permanent land art installation in Hadley, Massachusetts. Anthony’s installation — recipient of the Riverscaping Competition Grant — truly exhibits his ability to capture and magnify the most subtle dynamic patterns in nature; ones we would not notice without seeing his work. I caught up with Anthony recently to learn more about his project and process. Kim: Would you please explain the background — how was this project initiated? And what were some of the key factors considered during the design process? Anthony: This project was awarded a grant through the Riverscaping Competition which aimed to raise an awareness of the Connecticut River through a series of art installations. Undulated inundation continues my research on dynamic patterns and interactive fields. The river is a constantly fluctuating and ever changing surface. The color, the level, and the current change over time. Hadley has recorded several flood plane changes over the last 100 years. These flood planes marked four distinct heights above sea level, and are within a certain height from each other. Undulated Inundation references the flood planes as well as the fluctuation of the river. The reference of the ground plane along with the horizon sets up a contrast with the arrangement of the vertical steel poles. 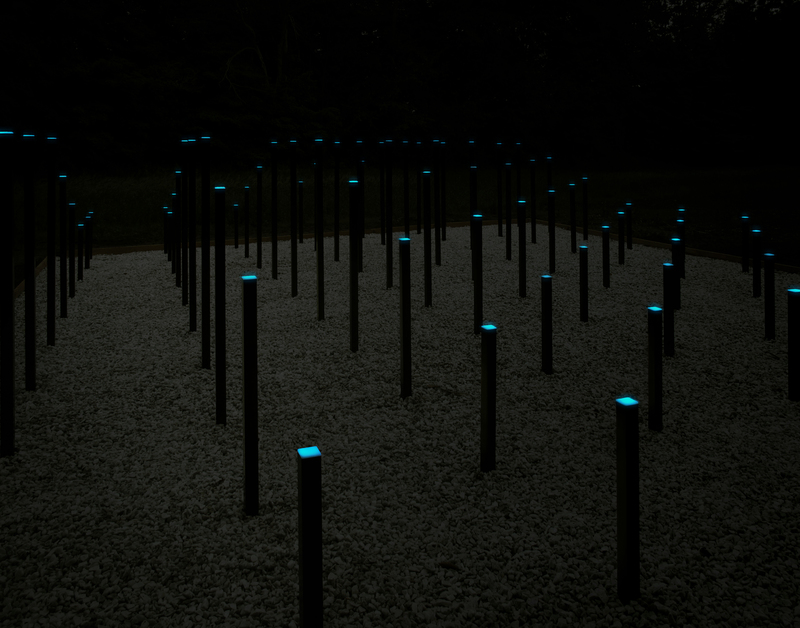 The undulating heights of the poles are further articulated with photo luminescent caps which provide a subtle glow during the night. Kim: Would you explain more about the specific roles your partners played in this project? Anthony: I think it’s important to note that collaboration involves trust. For this project, I’m thankful to several people for their trust, and I’m glad that my trust in others created a truly collaborative project. I would like to thank Thom Long and members of the Riverscaping committee for acknowledging my work and giving me this opportunity. I’m grateful to Susan Lisk, director of the Porter Phelps Huntington Museum who was patient with the construction process, positively inquisitive about my design intentions, and graciously supportive of this project. I’d like to also acknowledge the spontaneous collaboration with Jarrett Man of Stone Soup Farm who donated time and an unselfish amount of effort on this project during the earth moving stages. The two contractors on this project have a unique working relationship and a high level of trust and respect for each other. It was a pleasure being able to work with them and to assist and learn in their process. Working with vendors who were able to operate outside of their typical manufacturing routines was very educational and encouraging. Polymer Molding (Erie, PA) willingly worked with myself and Chroma Corporation (McHenry, IL) to supply the glowing caps for this project. I think it’s a very positive moment in a project when manufacturers are willing to try something different, guided by a knowledge of the process while maintaining an inquiry for innovation. Kim: What projects, ideas, theories, books, music, architects — whatever it may be — have helped to inspire this project? Anthony: The project was initially inspired by the river, the fluctuation in surface as well as our relationship to this constant change. My intention is not to literally represent nature however. This is a very important distinction that defines my method and general approach. Some past work has been incorrectly interpreted as such because I consider natural elements in many of my dynamic field projects. I’m more interested in nature’s systems and what they teach us. I was also inspired by piers or markers within the water that allowed one to recognize and develop an awareness of the water’s surface as a referential plane. Other inspirations include pix-elated surfaces that change in depth, new methods of representing topography, as well as land art and what I refer to as interactive and dynamic fields. I’m particularly fond of the kinetic installations of Jussi Ängeslevä and the mirrored and light rooms of Yayoi Kasama. Kim: What have you learned about your own process through this project and how does it fit into your individual working method? Anthony: This project helped me further categorize my design process and work as it relates to 6 main topics: collaboration, fabrication, material, community, pattern, and land art. 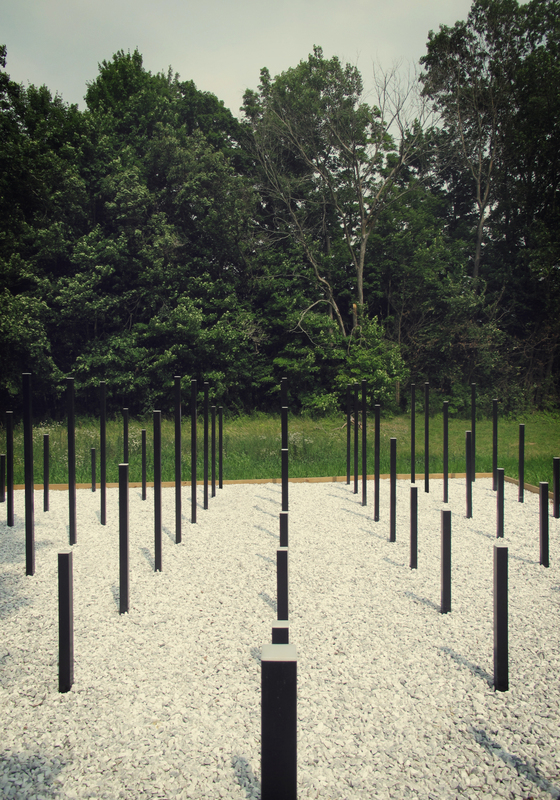 The piece is a temporary installation for the Porter Phelps Huntington Museum in Hadley, Massachusetts. Reference plane boundary filled with gravel. Kim: Please discuss the lessons learned from this project, how might they relate to the larger built world? Anthony: This project is a very small land art installation. The project succeeded in creating a place on the Museum’s land that was forgotten, so it does maintain a larger impact than its footprint. In terms of its application at a larger scale though, I’d say that the lesson here returns to the idea of awareness. It’s initial intent was to assist in making the participants aware of the ever changing river, to interact with an object in the landscape, and enjoy, wonder, and question variation within an ordered grid of vertical poles. The project is very dynamic in many ways, through the undulation of the pole heights as well as the changing views within and around the field. In terms of improving the larger built world, I would encourage this kind of user participation, and creating spaces that people want to explore, stop, look, and better understand their position in relationship to what is built around them.